If you didn't this about PSN, every PSN account can be activated on 5 PS3s at any one time, so 5 people can use the same DLCs. I propose we make a group to share idolm@ster 2 (or other DLC if applicable) DLCs to split costs. I don't actually have a PS3 right now, but I am willing to contribute money for DLCs until I get my hands on a PS3/copy of the game. Anybody else interested? Edit: PS3 and Japanese copy obtained/in transit. The edit strikes back: PS3 obtained; waiting on game. Re: IM@S PS3 DLC Sharing Group? I'd like to try that! There's two notes I have to add to this. The Asian version and the Japanese version (From the people I talked with) actually identify themselves as different versions of the same game. Well, to be more precise, a Japanese friend couldn't get the Asian DLC to work with the Japanese game. Long story short, a pooling service would only work as long as everyone in said group actually had the same version of the game. The second of course, is trust. Sadly, a limited version of this can be applied to the 360 (to one other person to be precise) - but I never got any takers. I'd be interested in running one, but well, mostly the fact I've never found anyone interested in contributing even a fraction of the costs. With the Xbox, there is even more of a trust issue: One person has all the licenses, while the other uses the gamertag online for DLC (Which one can screw over) while for PSN one just needs the account attached to the PS3; You only need to login to download licenses. It doesn't surprise me that much that the disc codes for the two versions are different (DLCs are attached to the disc's code, not region), but the only way to prove this is to look at the save directory name (It uses the disc code if I remember correctly). Anyway, changing the login information is discouraged because then you wouldn't get any more DLC from the rest of the group (Plus your IP is logged here). Doesn't stop a third party share - namely, if I give my account to you, what's stopping you from giving it to other two people (and consequently running down the number without my knowledge or anyone else's for that matter?) and what can I do to stop it? There'd be no way for me to track this, and that lies in (most of) the problem. At least with the X360, there was no real way you could 'outrun' the acount the way the PS3 can. The other half is of course, proving people will actually stump up. Generally it's just due to the fact that well, to get the DLC only one person has to pay. So you could (and I've seen this happen) have cases where people promise to pay in, then once they get access to the account, lock it out for use with everyone else. This can be devistating if it was run at say... catalog 15 or so. So combining the two, you're asking for some serious trust, and I'm not entirely sure if people are willing to actually put their money where their mouth is. Essentially what happens if anyone DOES try to do a runner, they can't take the account, and they get locked out of any future releases - meaning they can only access what they paid for to begin with. You'll still have to trust the gatekeeper now, but well, can't fix everything. This scenario requires you to trust SOMEONE so take it as you will. It does mean you can't redeploy any of the five uses if anyone goes rogue, but well, that's one way around it. 1) Used the "DLC account" to purchase the DLCs. It says something along the lines of "unable to read partial download content data. please download the catalogue first issue from the menu "765 shop catalogue"'s "catalogue download"
Did you download the thing like the error message implies? 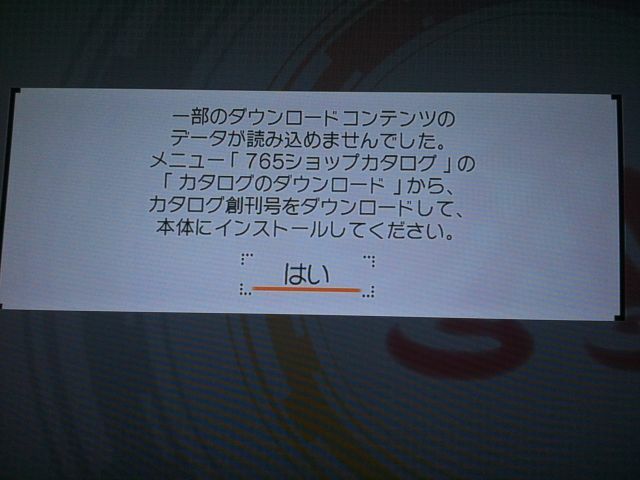 When playing idolm@ster sp I had some weird glitches with buying the DLC in game and buying it strictly from the playstation store. It sounds a little bit like that but I really have no clue. Part of the downloaded content data could not be read. Please download and install Catalog No. 1 to your PlayStation 3 by choosing Catalog Download from the 765 Shop Catalog menu. From what I was reading before, you need to have the actual catalog data installed on your PlayStation before you can use any of the items/song/etc from that catalog. Downloading them or purchasing them from the PSN store without the catalog installed won't work. (It even warns you about this when you look at the items through PSN.) You could either install the catalog like it says in the error message or go to PSN directly and download and install the catalog from there. Oh yeah it worked, thanks. I thought for a moment I had to redownload individual items from catalogue or something. Sort of. If anything, it makes DLC easier to steal - Remote deactivation only means they can deactivate WHEN the device shows up online. So this in short means that you can round robin it - One person has master control, and system, then 'give' the second person access long enough to download all the licenses, then take the system offline remotely, then repeat the process. I suspect they might find it just a little suspsicious after a while but well, that's the risks with the system. While this change doesn't apply specifically to most of us (or DLC? ), I do think one can't rely on the rules remaining unchanged in the long term. edit: not EU, but the 5 countries listed, two of whose abbreviations I don't recognize. Apparently this new change affects the US as well; It's posts on their blog also. It's safe to assume that it is a global change. Like Setsuna said, only 2 systems can be online, but an effectively unlimited number can be offline. I personally won't play online all that much, so I'm willing to take an offline "slot". It effectively enforces a variation of the X360 rules - Which is one online, and one console, but it at least allows the transfer from one console to another. In the X360's case, it's easier to administer, but it caps out since the account version MUST be online. The console can be optionally, but not the online account. Essentially though, the real problem is that in the case of im@s, you'd HAVE to update once a catalog, and I can personally confirm that there's at least 12 (read them, it's scary) more catalogs. If the list gets too long, we could... uh, be here for a while. Assuming we don't have a 'Steal an account' scenario of course, but that's strictly a trust issue. Oh, and almost forgot - when they say 'remote deactivation' they mean ANYthing that allows it to connect to the net. So this means the moment it detects an online connection, you'll download 'updated licences'. In short, if you were to take the 'hide' route, you MUST NEVER EVER take the system online for anything. And of course, they may attach licence time limits, requiring reauthentication. It could prove cumbersome particularly if they make the period short (Sub 1 month) I can't confirm if the latter will exist though. Well, technically two consoles could be online at the same time, barring DLC restrictions. One or both console(s) get licenses revoked a couple of times each month temporarily. Also, I don't really need any online functions; I am mostly an single player person and I have Xbox Live/PC versions for any online functions.